In a rapid changing market, PGP allows you to find new points of reference and gather the right informations at the right moment! 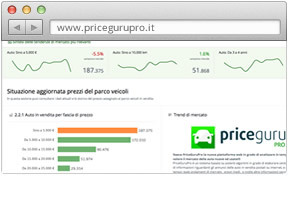 With PRICEGURU PRO the Automotive Market has no more secrets! Introducing PGP: the first analysis tool about the Automotive Market, built using top notch BIG-DATA and CLOUD-COMPUTINGtechnologies, able to produce detailed reports about market trends, prices history, sales, and much much more. PGP is a tool able to provide you with informations hard to find before now! 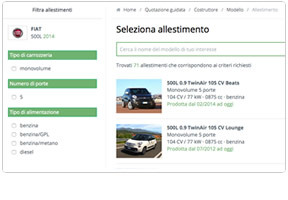 PGP's analysis and reports are created by gathering informations from multiple public sources, like classified websites, new cars' registration reports, used cars' sales reports, integrated with other informations of public domain. All this data is refined daily through sophisticated algorithms which are able to calculate market trends and values in seconds. If you were looking for an innovative and advanced tool, PGP is the right choice to help you make the next move in the automotive business! 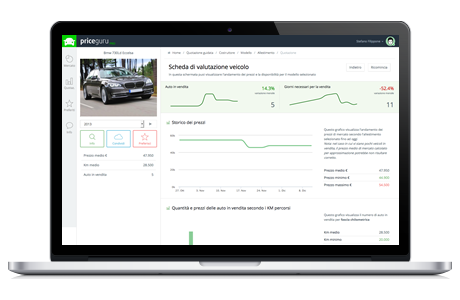 PGP is the first and only platform which provides you with a complete vision of the market, and helps you define in detail the right price when buying or selling a used car. Get access to all main market indicators that allow you to evaluate in advance relevant trends and gain the ability to plan your next strategies. 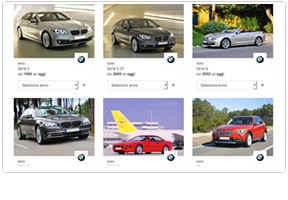 Browse the catalog of cars on sale since 1990. 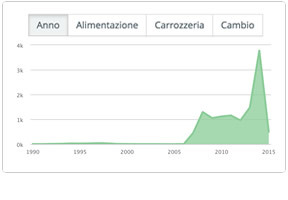 For each model analyze sale volumes, trends and price history. 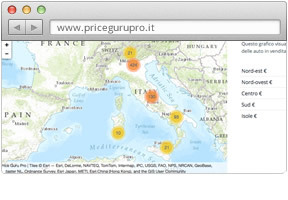 Find out where cars are sold with area reports, and analyze the historic data of availability and dealers number. 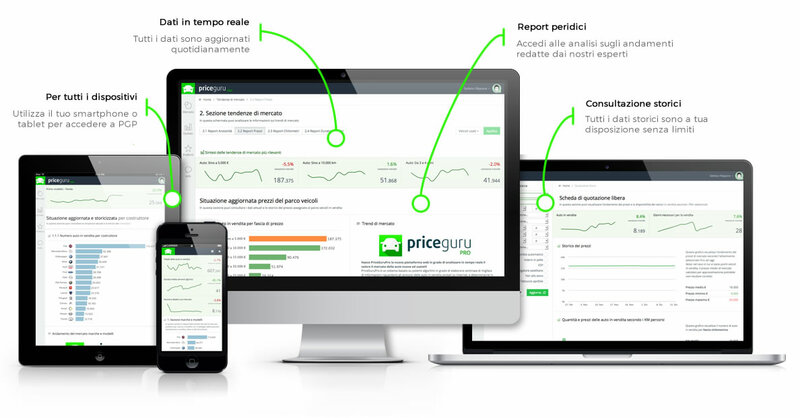 Our analysts will provide you with periodic and detailed email reports, which are of great help to better understand and give useful meaning to the most relevant market trends. Analyzed customers preferences on technical car specifications like for example type of fuel, type of transmission, or body type. PGP analyzes and save prices of all vehicles sold all over the national boundaries, allowing you to access car market values and history of depreciation for each model. 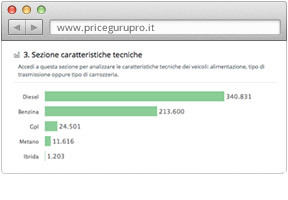 19%Cars on sale with automatic gaerItalian consumers begin to prefer automatic cars!